I normally rely on one of my own biscotti recipes, but I decided to pull out a copy of The Field Guide to Cookies by Anita Chu, of the blog Dessert First. It’s a nifty little book – a true field guide, if you will – of over a hundred cookies, with tips and a picture of each one. It’s been on my shelf for a while, and I’ve been keeping it handy for just the right moment. And now seemed to be it! To make a long story short, these were just the right cookies. The addition of butter makes them a bit more tender than biscotti made without it. They were simple to put together and one could vary them by swapping out another kind of nut. A teaspoon of anise seeds or a nice dusting of ground cardamom could take them in another direction, if one was so inclined. And when seasonal fruits are in full-tilt, like sweet-ripe nectarines and peaches in the summer, or Comice pears in the fall – crunchy cookies like these biscotti, served in a bowl alongside, are always a welcome accompaniment. 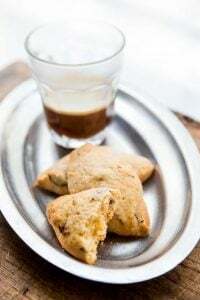 I also like having biscotti around because they make the perfect little treat to dunk into my ritualistic cup of dark espresso after lunch, so you can make a big batch and keep them for weeks – and dip and dunk whenever you wish. Adapted from Field Guide to Cookies by Anita ChuI tinkered with the recipe just slightly, dialing up the cornmeal and adding a few more nuts. I’m thinking next time, I’ll add a half-cup (60g) or so of chopped dried sour cherries to the dough. 1. Preheat the oven to 350ºF (175ºC.) Line a baking sheet with parchment paper or a silicone baking mat. 2. In a large bowl, whisk together the flour, cornmeal, sugar, baking soda, and salt. 3. In a separate bowl, mix together the eggs, lemon zest, and vanilla or almond extract. Make a well in the center of the flour mixture and pour in the beaten eggs. Add the butter, then mix until the dough is wet and crumbly. Add the nuts and stir to get them mixed well into the dough. 4. Turn the dough out onto a lightly floured counter and knead a few times until smooth. Divide the dough in two, and roll each portion into a 13-inch (33cm) long, then transfer them to the baking sheet. Leave ample space between the two logs as the dough will spread a bit during baking. 6. Using a sharp bread knife, slice the longs crosswise into individual cookies, each about 1/3-inch (1cm.) 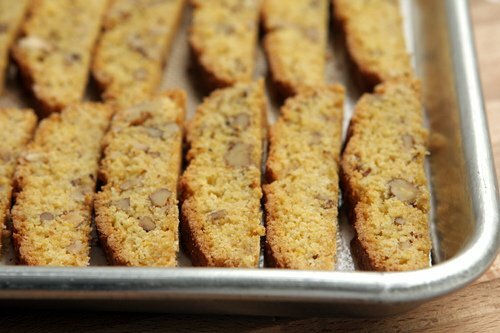 Place the biscotti on the baking sheet, cut side down, and bake for 20 minutes. 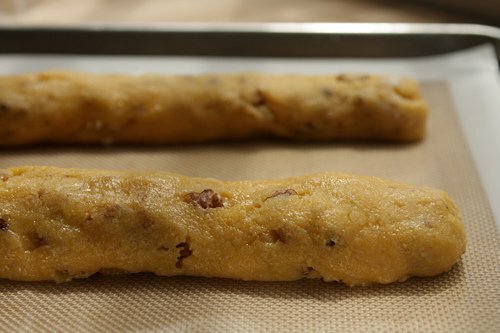 Remove the biscotti from the oven and turn each one over, then continue to cook for 10 to 20 minutes more, until golden brown. Let cookies cool completely, then store in an airtight container. These biscotti will keep for at least two weeks. Mmmmm! Sounds excellent. And, every time you mention sour cherries, I end up at Trader Joe. I’ll eat anything alongside a white nectarine this time of year! Before I whip out a batch, do you know if the biscotti freezes well? Mmm, David what about adding ginger? I have a biscotti recipe with all three crystallized, powder and freshly grated ginger. These sound delicious! I have to agree that a bowl of fresh peaches (grilled, maybe? ), a scoop of homemade vanilla ice cream, and some cornmeal biscotti, would make a wonderful dessert! just picked up some beautiful stone fruit from the Ferry Building farmers market in San Francisco…have some Straus Family Creamery vanilla bean ice cream, and gonna make this biscotti recipe for a killer dessert tomorrow night…thanks David! I’m picturing some of these biscotti crumbled between layers of juicy peaches, with whipped cream on top. Perfect parfait! Thanks & welcome back. I love this idea, how perfect with summer fruits! This is very similar to an old Piamontese recipe for cornmeal biscotti, the only differences I find is that instead of vanilla it calls for 1 (large) tablespoon of Anise liqueur, 1 1/2 tablespoons of of toasted anise seeds and 1 (large) cup of chopped chestnuts “rolled into some dark cocoa mixed with some cornstarch before adding to the dough”. Either way, anything with cornmeal has my name all over it. I often add anise seeds to biscotti, too. 1 1/2 tablespoons is a lot – but I do use them from time-to-time. 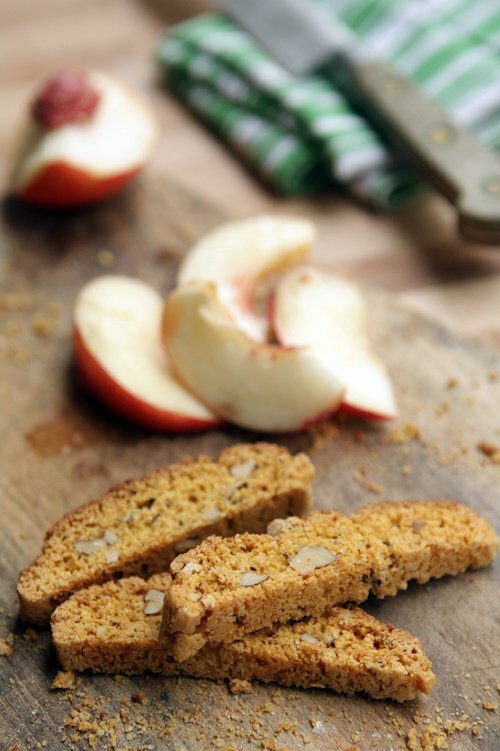 Cornmeal biscotti sounds like the perfect late-summer pairing for fruit. The thought of a Comice pair in fall…wow. I crave cornmeal sometimes, too. You have converted my never-ending craving of polenta into biscotti. And it’s perfect beach picnic food! A little sandy grit can be passed off as cornmeal. I have gone cornmeal crazy this summer! I’ve made three different cornbread recipes (well, one “corn bread” and two “cornbreads,” if you ask the experts; I’ve learned not to mess with them), rubbed cornmeal into crumble toppings, and then, of course, there’s that beloved corn-cherry scone recipe from The Cheese Board Collective… I can’t get enough. And now you come along with cornmeal biscotti. Perfect! Speaking of that Cheese Board scone, you reminded me of it when you suggested adding chopped dried cherries to these biscotti. I am going to DO IT. Thanks for this, David. Wow, cornmeal biscotti! Never tried them before, but looks like a fine piece of cookie! I am digging the cornmeal concept! How do the walnuts compare to, say, a firmer nut like almonds? Big yes on the cherries…. This could be next on the menu, but I may have to repeat the tahini cookies first. This sounds like a perfect, not too sweet treat. I’m with you on the post-lunch espresso. I think I’ll make these right now! I happen to have some polenta leftover from a blueberry-orange polenta cake so this is perfect. Maybe I’ll try orange zest instead of lemon since I have that on hand. Hello, what is cornmeal in Europe? Is it polenta? 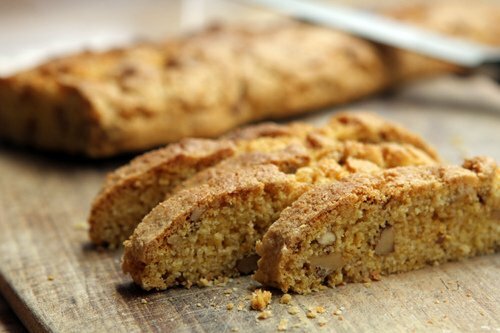 These biscotti’s sound and look great :-) Can these be made without eggs? If so, what’s the substitute? Thanks. 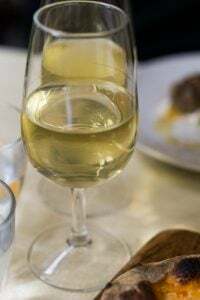 Where do you find cornmeal in France? I have semolina, but actual stone-ground cornmeal? Can I order it from somewhere? Thanks, I can’t wait to make these! I buy cornmeal at the Arab épiceries and markets, where it’s sold in bags. I’m not sure what specifically it’s called since I usually dump the bag into a glass jar for storage. But you can also find it at natural food stores, like Biocoop or Naturalia, and in a pinch, I’ve used the instant polenta in the French supermarkets (I don’t like instant polenta, but it works as a substitute for cornmeal.) Am not sure what is stone-ground or not, since they don’t list that on the packages that I’ve seen. I like to use cornmeal in pancakes sometimes. I love that slight grittiness it gives to baked goods. Hadn’t thought of biscotti, though, but I can easily imagine it being great. Anita is a brilliant baker. I have yet to make a decent basic biscotti but I’d be happy to help anyone out. I wash dishes better than I bake. These look amazing. 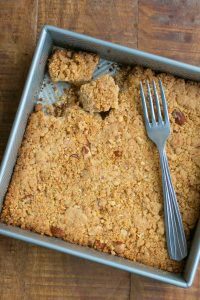 I tend to crave cornmeal baked goods myself and have made savory biscotti out of the batter I use for Thanksgiving dressing that make great accompaniments to salads and soups. I will look forward to trying this recipe. they say in venice they make cornmeal biscuits called zaleti.. in the julia child book, they style them as biscotti.. these remind me those!! that recipe had currants and lemon zest! I’m making fresh peach ice cream for an al fresco dinner this weekend and I was planning on making a cookie for alongside. This will be perfect. I’ve been squirreling away (read, freezing) my Kentucky peaches so we have some this winter, but I just got a fresh batch from the CSA and we were talking about cornmeal over dinner last night. The stars must be aligned. Thanks for sharing this recipe and your variations on it. I, too, love having biscotti around to dip in my after lunch coffee. This looks absolutely tasty! I love biscotti as well! Yummy. Yes, I was looking for the dried cranberries or cherries. Cardamom sounds fabulous. I’ll have to try these. I can’t imagine cornmeal in a cookie. When I’ve eaten any baked good or fritter that contained cornmeal cooked until crisp, the cornmeal was like eating sand; it gets too crisp and feels like biting down on pieces of sand or a piece of a broken tooth! But I’ll try it because you give it a thumbs up. David….Have I missed a post about the remodel of your kitchen? Have you moved back home and is it completed?? Someone just sent me a link from Food52 that featured Yottam Ottolenghi creating his own polenta to be served with an eggplant salad. Maybe that can be the first step in creating one’s own cornmeal? Maybe? Since there’s egg and butter, could one use ALL cornmeal? I love biscotti, but a critical family member is moving toward less wheat. I’ve not tried them with all cornmeal but I would imagine the dough would not hold together. 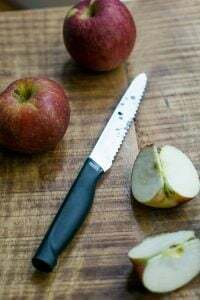 You could perhaps play around with it and use some corn starch, or an alternative flour – and there are some wheat-free ones, although I’ve not tried them with any. How serendipitous! I made your recipe for chocolate biscotti from your Ready for Dessert book about three days ago! It’s always a hit. a beautiful little recipe. Come fall, and I will be in full swing of all things, biscotti. Nothing is better than dunking these treasures into a cup of tea. … Now I long for cooler temps (it’s 104 as I type), mostly so that I can turn the oven back on and get cracking on these, oh so tempting, sweet delights. Mmmm! Looks great! Do you have a cornmeal pizza crust recipe you like and wouldn’t mind sharing? Too bad most US corn is GMO corn, wish I could get away from it! Oh you are making me hungry and I don’t have any of the ingredients on hand! I love reading your posts and will just have to dream about your biscotti for now. Oh, yeah: cornmeal biscotti with dried sour cherries! @bobster — if you buy white, blue or red U.S. corn it’s not GMO (yet) — they only mess with yellow corn so far. Places like Bob’s Red Mill says their cornmeal is grown from non-GMO seeds. I would imagine a natural foods store in your area would carry similar cornmeal. Cornmeal is the one thing I have absolutely not been able to find in France. In Burgundy we don’t have arab markets, and they don’t even have it at our natural food markets. At the moment I beg visiting American friends to bring me a box. However to answer Clarie’s question, you can order it in France at http://www.myamericanmarket.com, along with other American products. Not cheap, since you pay shipping, but they do have anything you want. Meanwhile David if you find out what it’s called at these arab markets I’d love to know, maybe I can look when I’m in Paris. Because now I have to use some of my precious stash to make these cookies! When I saw this recipe I knew that I had to try it. This morning I woke and baked them and they came out perfect, they were absolutely delicious. I did add a teaspoon of fennel seeds. 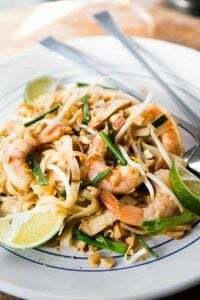 Thanks David for sharing this recipe I know it’s one that I will use again and again. I was dying to make these yesterday but alas, I had no cornmeal. Instead I substituted an equal amount of semolina and they came out great. While I plan on trying them with the cornmeal, I generally like the texture of semolina better, so I might end up using it as a permanent substitute. 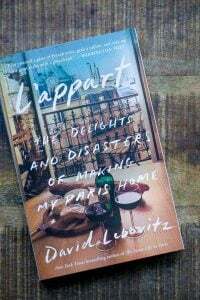 What sounds even better to me would be the recipes for the summer fruit compote and nectarine sorbet! Hopefully you will post those next! Would be perfect in our 100+ degree weather right now as I’m not even using my oven if I can help it. Thanks! I am definitely making these. Cornmeal is wonderful for Diabetics and I gather as many recipes as I can get my hands on. This will be on my blog soon, also. Thanks. PS. I love almonds and honey with my cornmeal goodies. Simple little cookies. Great! I think the all cornmeal would work because I make a lot of gluten-free substitutions. My cornbread recipe calls for all cornmeal. If it gets crumbly, a little Xantham gum might work as a binder. Anyway, I can’t wait to try one of your ice cream recipes soon. And, the cookie will work well with it. oh cornmeal is so marvelous! i bet it makes an amazing biscotti. Marie B: Thanks for letting folks know. I’ve not used Xantham gum but appreciate the tip! 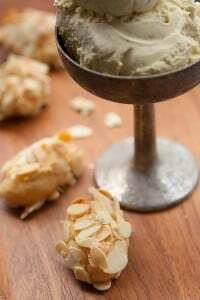 Becky: The recipe for Nectarine Sorbet is in my book, The Perfect Scoop. The compote is just sugared sliced fruit with a few drops of kirsch. Lynn: It’s probably best just to go to an Arab, Sri Lankan, or Indian shop and see what looks to resemble the cornmeal that you are used to. I know it comes in various grinds and it’s often not labeled. 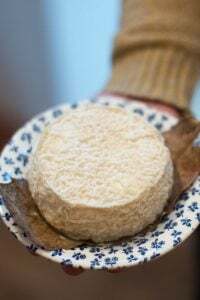 You can find it called Semoule de Maïs or Farine de Maïs. made these.turned out very very good.Thanks for recipe. I always lay out cut biscotti on a sturdy wire cooling rack for the second bake, they dry on both sides in less time with no flipping! I often find that biscotti don’t need to be flipped to brown and crisp up on both sides. But because of the cornmeal, the browning wasn’t even so I did flip them. 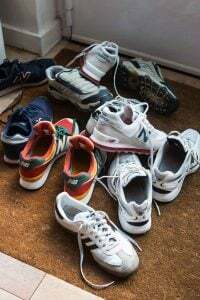 Putting them on a cooling rack is a good idea and I’ve done that as well. Two batches, using wine-plumped raisins, were quickly devoured this weekend, with many complements! People who don’t like biscotti loved them! I never had any luck making biscotti. I tried this one because I like cornmeal. They turned out great on the first try. Thanks David! 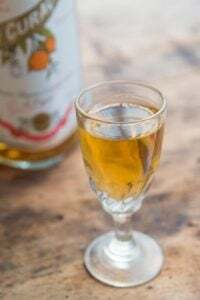 I used macadamia nuts…I am thinking it would be good with candied orange peal. Hello David. I just tried these, mine turned out way spread out and skinny (?) don’t know what I did wrong, but they still taste wonderful! Is that right, baking soda and not baking powder? PS just read Sweet Life in Paris….. loved it. thanks for all your stories and recipes!! …and glad you liked the book – thanks! Hello David. I found this recipe Saturday afternoon,8/4, then made these biscotti Sunday morning for an afternoon cookout. My favorite comment from the group, “You MADE these?” They thought they had come from a bakery. Today is Monday, 4 biscotti left. By the way, I, too, loved the book. Am heading back to Paris in 2 weeks and will return to BHV, La Grand Epicerie and LaDuree. Just wanted to tell you that I made these biscotti this morning. Many of them did not make it back into the oven for the second baking… slice one, eat one, slice one — well, you get the picture. And this afternoon it will be an espresso pan conna with a cornmeal-walnut biscotti. I made a batch of these and gave them to my mother-in-law. I thought they were very good, especially with a cup of coffee first thing in the morning, but she is CRAZY about them! She polished off hers in a day and demanded that I make more (so I did, and I think she’s almost done that batch also). Not sure if I should be happy or nervous about the monster I’ve created. Oh, and a question: Said mother-in-law is generally anti-sugar and wants me to leave it our entirely, but I suspect the resulting biscotti will be dry inedible rocks. Do you agree? It’s tough explaining to a non-baker that sugar does more than just make things sweet. Thanks for sharing the recipe David. Polenta and butter makes these a lot easier on the teeth!! And they were delish!!! I made these yesterday for my cousin but his gf is allergic to nuts, so I baked them with orange zest and dried cranberries instead and they turned out great!! Thanks again!! ooh, I just made them, and I’m agreeing with you and the commenters – the butter and polenta make these ever so muncheable. It made so many cookies, too! I absolutely can’t wait til tomorrow morning to have these with coffee. I just made these, and they’re absolutely delicious! I added 1/2 cup of dried cranberries instead of the cherries. Next time I’ll try the anise seeds. Made these hoping the kids would eat them. I want more fiber in their diet. I used roasted almonds and squeezed some lime juice in. (I used lime, not lemon) Between my husband, his cousin and my two kids these are almost gone within 24 hours.